Buy Steam Wallet Codes for Philippines and pay using Globe or Smart load, Gcash, online banking, ATM transfer or counter payments at any of Philippines's leading banks, Robinsons stores or Bayad centers. There's no credit card, registration or login required, and the code will be emailed to you upon confirmation of your payment. It's the best way to top-up your Steam Wallet Philippines online without a credit card! Buy Steam Wallet codes online with no credit card! Add Steam Wallet codes to your Steam Wallet Philippines in just 3 easy steps! Simply choose the voucher denomination that you want, the payment channel you wish to use, and then enter your email address. You'll then be asked to enter your phone number to receive a secure OTP. Complete the payment and your Steam Wallet Code will be automatically emailed to you. You can then redeem it on Steam. About Steam Wallet Codes: Thousands of gamers in Southeast Asia use Steam Wallet Codes to top-up up their Steam Wallets. 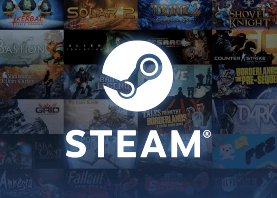 Steam Wallet Codes work just like a game activation code, which can be redeemed on Steam for the purchase of games, software, wallet credit, and any other item you can purchase. Don't wait! Get your Steam Wallet code online from Codashop right now and enjoy uninterrupted access to games such as Dota 2, Team Fortress, Counter-Strike and other top titles.